Numerous oil and gas seeps occur on Java Island concealing prospective basin sediments. However, most of this island is covered by volcanic products of Paleogene to Recent times. The volcaniclastic sediments buried the source rocks, burying the source rocks to depths of oil and gas windows. Oil and gas seeps in volcanic areas of Java show the presence of active petroleum systems underneath the volcanic cover. 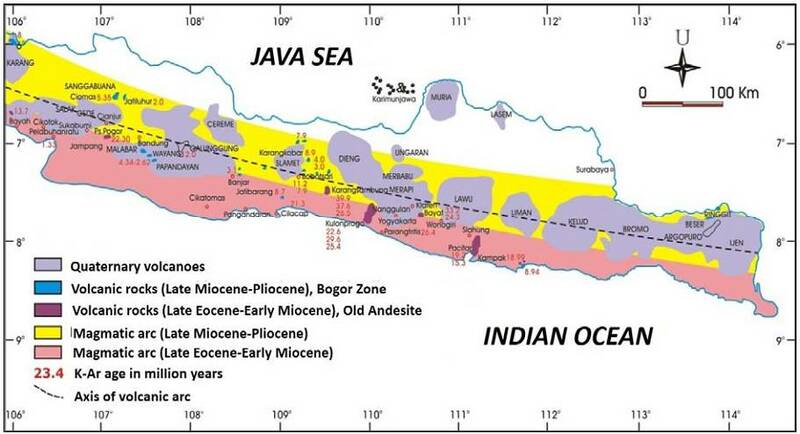 This indicates hydrocarbon prospectivity on Java Island (subvolcanic play) that is so far unexplored. Volcaniclastic covers are notorious for causing poor seismic data quality, making subsurface imaging difficult. This will challenge the methods and techniques of seismic and nonseismic data acquisition and processing. Once these challenges are resolved, the subvolcanic play of Java may be revealed. Read the abstract, or click this to read the full text. If the link doesn’t work, please contact the author to get a copy of this paper. Tagged awang satyana, exploration, Java, non seismic data, oil and gas, oil seeps, seismic, volcanic.